Account enumeration is a potential security risk whereby a web site gives out information about what accounts are already in the system. This may a) leave them susceptible to a brute force-esque attack and b) may violate their users privacy which may be very important for certain types of sites. There are a couple of prominent Irish websites covered below which I’m familiar with and I just happened to notice they allow account enumeration but it is important to note that the vast majority of ecommerce sites online do this too. Certainly there are greater security risks out there such as SQL Injection, badly stored passwords, not using https when you should etc. but when this exploit is found alongside other exploits… well let’s just say that’s when bad things can happen. 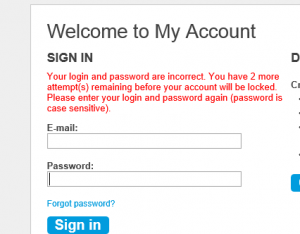 Ticketmaster do appear however to have an account lock out facility which locks accounts after 5 failed accounts. What this means is that although an attacker can find out if an account exists due to the slightly different error messages returned (which would be really bad for a very private site.. think ashleymadison.com) they will only get five password tries thus a full on brute force attack against a specific account with a password dictionary is not feasible. Although locking accounts help mitigate against brute force attacks there are a number of potential problems with this approach. It can for example leave ticketmaster.ie open to an account lockout attack, whereby the attacker can deliberately lock out a large number of accounts in a denial of service-esque attack (this is possible as ticketmaster sends a reset password rather than URL to reset a password). It also means an attacker could build a large list of valid accounts and try the same password on all of them (ticketmaster1234 perhaps) which could return a few matches. Ideally ticketmaster would not reveal if an account existed or not. 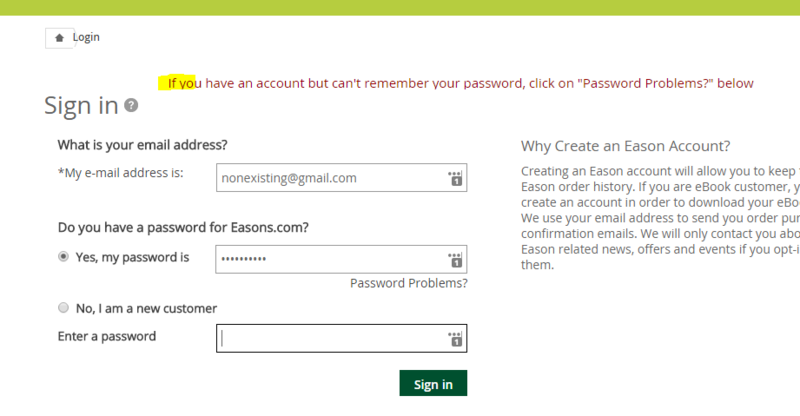 preventing account enumeration on the forgot password page? 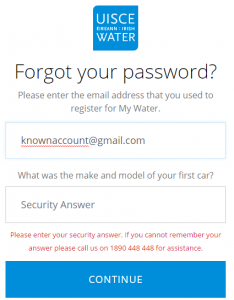 Remember water.ie who upon failed login just presented ‘Please enter a valid username and password’ to the user? The first image below is what the forgot your password screen shows when the account doesn’t exist, while on the right, we see what the screen shows for an account that does exist. 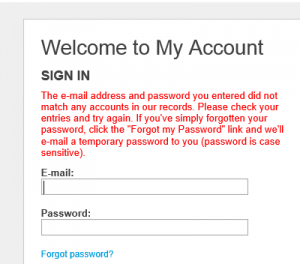 What should happen in reset password scenarios is that the website should display the same generic message regardless if the username/email address exists. A message such as ‘Further instructions have been sent to your email address‘ or similar is often used in both cases. If the email address does exist the email can contain a password reset link (not a reset password in email – search for ‘Sending a reset password versus sending a reset URL’) which the email account holder can click on if it was them that asked for the reset or ignore if it was not. 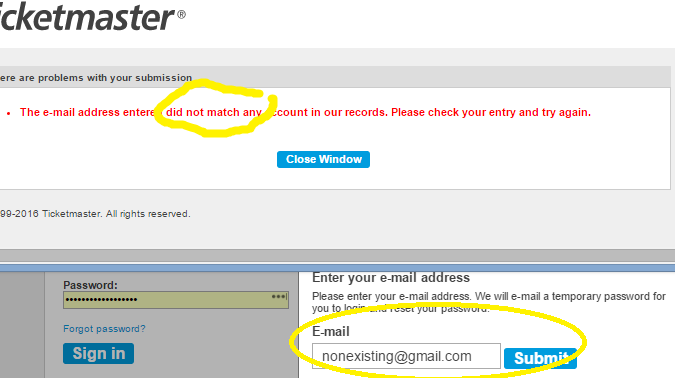 If the email account doesn’t exist in the user DB, just don’t send any email. 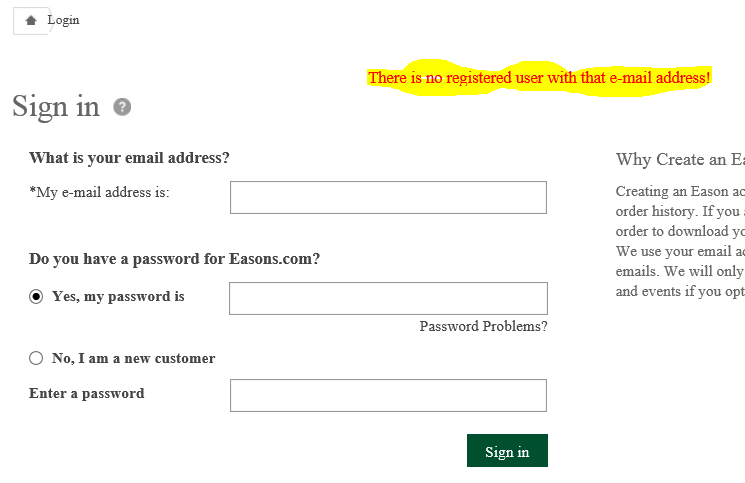 …but what about the registration page? I have to tell a potential new user that their chosen username/email is already taken on screen! Not necessarily. Preventing account enumeration is most problematic on the registration page that’s for sure, at least from a usability perspective. The goal here is the same as with the login and password reset pages and that is to keep the outward (what’s on the screen) process the same for usernames/emails that already exist and those that don’t. If the site uses the email as the username, it should be possible to do this pretty nicely and in a manner similar to before. It might require some re-jigging of your registration pages, but the idea would be to start the process by requiring the user to enter their email address. When they submit this notify them that they have been sent an email with further instructions regardless if the email is in the DB or not. 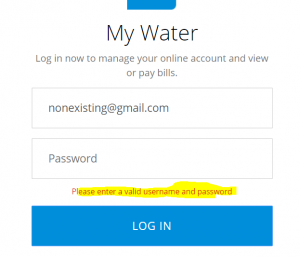 If the email address is already in the system the email will advise them that they have already registered and perhaps provide a link to the password reset page. If the email address is unused the email will contain a time limited URL link to verify email and continue the registration process. There is a very small usability hit on this approach as the notification about email addresses already existing now happens via email rather than on screen, but this will affect only a tiny percentage of registrations. 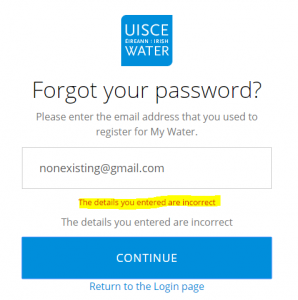 Note – water.ie is not really applicable in this case as their registration process begins with the entering of a application ID and associated pin which has been sent out in the post. What if a website uses arbitrarily chosen usernames rather than email addresses to login? Well, for sure preventing account enumeration in this case is a bigger problem than above. In this instance, the first step of the process could capture both of these and in the follow up email notify if the email entered is already taken and advise of the username already associated with the email. Not a major problem so far… but what if the email is available but the username is already being used by a different user. On popular sites, millions of usernames could already be taken, so it would be impractical to send a ‘username already taken’ email everytime someone tries to use an existing username as it could take them god knows how tries to find a free one. In this case, the best balance between security and usability may be to notify the user trying to register that their desired username is already taken on the registration page itself rather than via email but also to reCAPTCHA enable the page so scripts won’t work. This means the task of trying to find if a username already exists requires manual intervention by the attacker which significantly reduces their ability to build lists of existing accounts. Of course reCAPTCHA from Google and similar plugins by others are not unbreakable so there is no 100% perfect solution here. Your specific implementation is likely to be yet another trade off between security and usability. Use email addresses as usernames as this makes accounts easier to protect on password reset and registration pages. Show generic ‘Invalid username/password combination’ message on failed login. First registration step is user enters email address and submits, then the site shows generic ‘Further instructions have been sent to your email address’ message. If email is already in DB, email says already registered etc. If email not in DB, email should contain a continue registration URL. Troy Hunt’s (my favourite microsoft MVP by a mile) amazing article ‘Everything you ever wanted to know about building a secure password reset feature‘ from 2012 which was how I was originally introduced to many of the ideas above. Troy Hunt’s Secure Account Management Fundamentals PluralSight course. Another amazing resource from Troy. OWASP page on preventing brute force attacks. Note in particular the section on account lockouts and the potential exploits that remain even when doing this after X bad attempts. The surface space of many of these exploits can be reduced by preventing account enumeration on login, reset and registration pages as per above. please can I have your comments and/or questions? I’m very interested to know your thoughts on the whole topic of account enumeration so please feel free to leave a comment. If you’re a developer or IT professional and would like to connect with me on LinkedIn please check out my profile and send me a connection request.